This set of Concrete Technology Interview Questions and Answers for freshers focuses on “Complexity in Special Concrete, India in SCC”. 1. What is the moisture content in slurry for wet process? 2. The use of crushed aggregates may results in 10 to 20% higher compressive strength. Is this statement true or false? Explanation: The use of crushed aggregates may results in 10 to 20% higher compressive strength due to development of stronger aggregate-mortar bond. 3. In a dry environment, concrete strength will be loosed as much as __________ % in moist environment. 5. A ___________ paste structure undergoes ___________ creep. Explanation: The amount of paste content and its quality is one of the most important factors influencing creep. A poorer paste structure undergoes higher creep. 6. The rate of creep rapidly ___________ with time. Explanation: The rate of creep rapidly decreases with time. The time taken by a concrete structure to attained creep is 5 years. 7. The rate of creep generally ____________ with the ____________ of the size of aggregates. Explanation: The rate of creep generally decreases with the increase of the size of aggregates. Time rate of deformation of a material subject to stress at a constant temperature. It is the slope of the creep vs. time diagram obtained in a creep test. 9. “Shrinkage in concrete is caused mainly by loss of water by evaporation or by hydration of cement”. Is this statement true or false? Explanation: Shrinkage in concrete is caused mainly by loss of water by evaporation or by hydration of cement. Explanation: Dry intervals or patches can lead to crazing or cracking on the slab surface. The effect of surface wettability on the dynamics of crack formation and their characteristics are examined during the drying of aqueous colloidal droplets containing nano particles. 11. SCC has __________ yield stress. Explanation: Self-consolidating concrete or self-compacting concrete (commonly called as SCC) is a concrete mix which has a low yield stress. 12. SCC has __________ deformability. Explanation: Self-consolidating concrete or self-compacting concrete (commonly called as SCC) is a concrete mix which has a high deformability. 13. SCC has __________ viscosity. Explanation: Self-consolidating concrete or self-compacting concrete (commonly called as SCC) is a concrete mix which has a medium viscosity. 14. SCC has ___________ segregation resistance. Explanation: Self-consolidating concrete or self-compacting concrete (commonly called as SCC) is a concrete mix which has a medium viscosity and good segregation resistance. Explanation: SCC is measured using Slump flow test rather than usual slump test, as it is too fluid to keep its shape when the cone is removed from it. 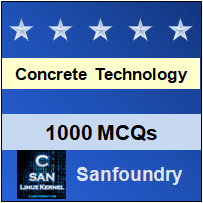 To practice all areas of Concrete Technology for Interviews, here is complete set of 1000+ Multiple Choice Questions and Answers.